How Much Cash Will Matthew McConaughey Get for a Commencement Speech? Apparently, it's a big fat secret! And currently the subject of legal wrangling in, of course, Texas. The university's contract with McConaughey's booking agency, Celebrity Talent International, includes a rare confidentiality clause, under which UH had to provide notice to the company that the information has been requested and give the agency an opportunity to object to the release of their information with the state attorney general's office. So the whole thing has been bumped over to the Texas A.G.'s desk, with the booking agency defending its right to keep all the details hush-hush. The letter argues that the contract and associated emails and hell, pretty much everything to do with this appearance is very confidential. They say disclosure would put their agency at a some vague competitive disadvantage, risk McConaughey's security by making his schedule public and maybe convince him to cancel the whole thing. Reporters are just so mean about where public money goes, you know? 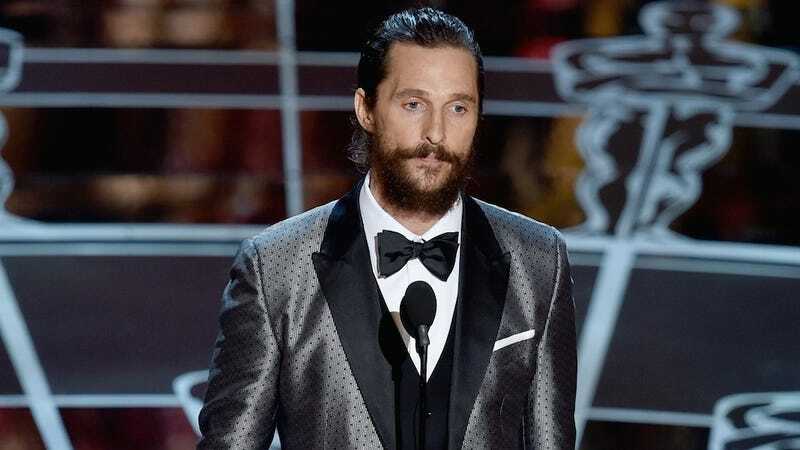 "All I can say is major names like Mr. McConaughey could easily ask for 3 times what he said he will do the event for," said CTI President Glenn Richardson via e-mail. "University of Houston is getting an excellent fee on having him for sure."